2017+ Ford Fusion Sport 2.7L Intake Pipes [FusionIntakePipes] - $350.00 : Eco Power Parts!, More Power for your Ecoboosted vehicle! 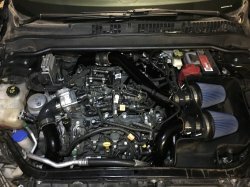 2017+ Ford Fusion Sport 2.7L Intake Pipes will work with the stock intake or any aftermarket intake that uses the factory tubes. These are 2.5" pipes from the intake to the inlet of the turbo in aluminum with black 4 ply silicone hoses. Intake pipe 90 degree 2” to 2.5” silicone reducer will require trimming to fit your vehicle. The amount varies but we found on our test fit as 2” on each side.